In this work Reynolds sought to re-invent a subject that had been developed by 16th and 17th-century Italian, French and Dutch painters. It was described by the St. James’s Chronicle in April 1777: ‘A Gipsey is telling a young Girl, sitting on her Lover’s knees her Fortune, and seems to be saying to her that she will soon be married to him, at which she laughs and is pleased, without well knowing what it means.’ The alarm on the young man’s face makes one wonder if the future foreseen is in fact more sinister. 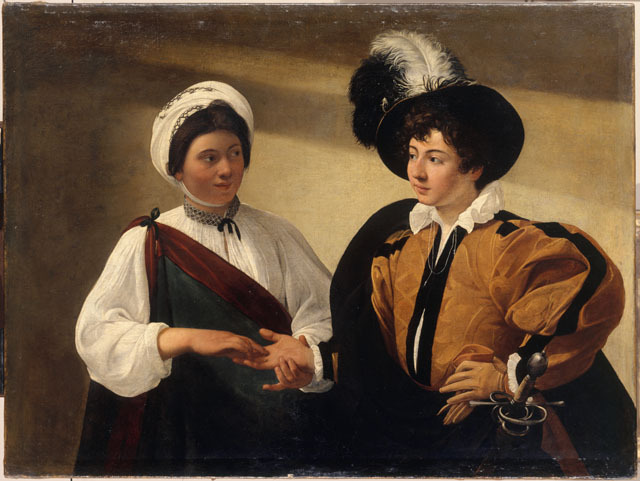 The composition recalls Caravaggio’s Fortune-teller (c. 1595-8, Louvre), then in the collection of Louis XVI of France. That work would have been known to the man who bought Reynolds’s painting, Frederick Sackville, 3rd Duke of Dorset, as he was British Ambassador in Paris. Reynolds may have seen the Caravaggio painting in the original or more likely in a copy or a print. 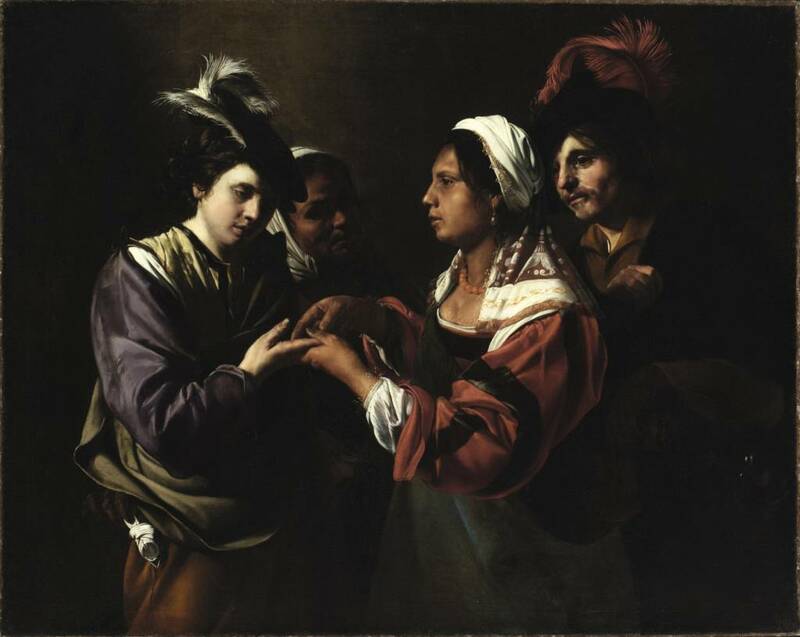 Another treatment of the subject, then also thought to be by Caravaggio (now Manfredi), The Egyptian Fortune-Tellers, that belonged to another patron of Reynolds, the Duke of Marlborough, might have been in the artist’s mind too. 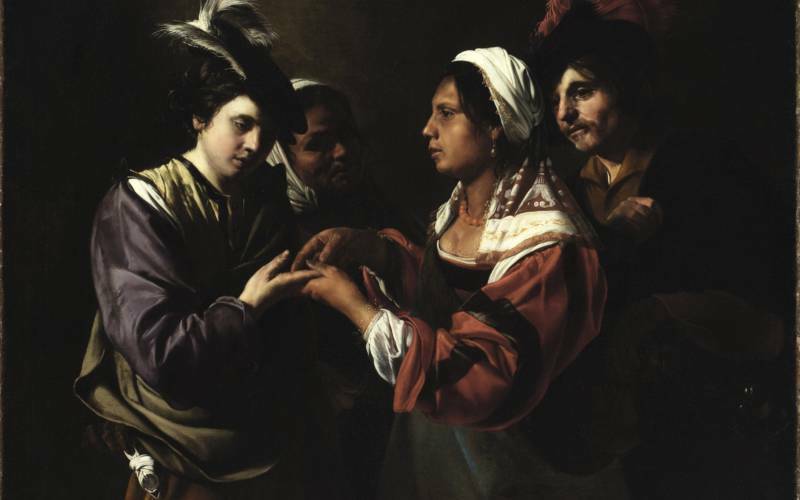 When Reynolds’s A Fortune-Teller was shown in the Royal Academy exhibition of 1777, journalists were puzzled about what kind of painting it was. 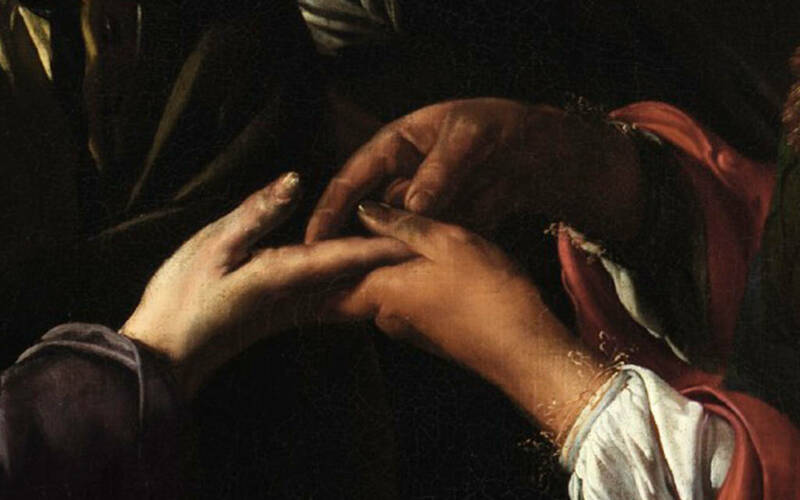 The large-scale, Italianate dramatisation of a moment pregnant with narrative possibilities and artistic quotations was worthy of history painting, but its subject matter and strong portrait elements were more characteristic of lowlier genres. 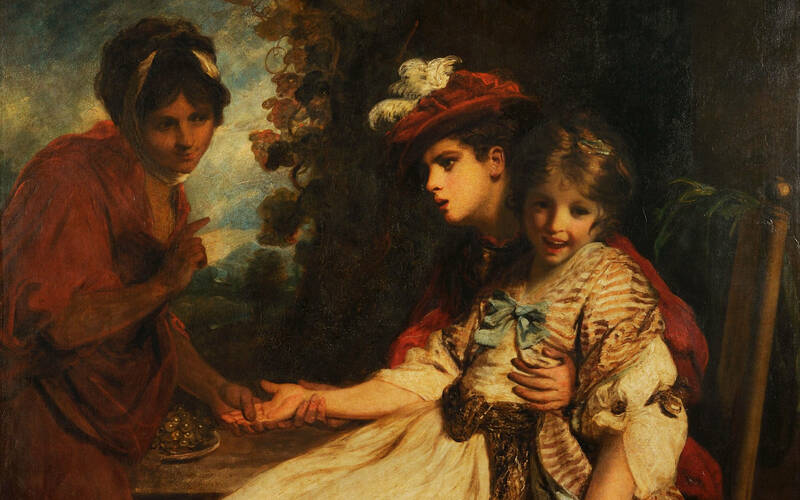 In the later 18th century, large format paintings of scenes of everyday life like this one were referred to as ‘fancy paintings,’ a type of work with which Reynolds began to experiment in the 1770s, just after he had been appointed first President of the Royal Academy of Arts. Significantly more expensive than his portraits (A Fortune-Teller cost 350 guineas, a full-length portrait 150 guineas), initiated by the artist himself rather than produced to commission, fancy painting’s playful subversion of the traditional academic hierarchy of genres, combination of sensuality and emotion, painterly virtuosity and light-hearted erudition, appealed to some of the most adventurous patrons of modern British art.